The King Guide wall charts are a useful reference to have visible in the hospital and pharmacy for situations where a quick 'yes' or 'no' answer is needed. With 122 IV drugs and 4 fluids the wall charts provide a comprehensive view of Y-Site compatibility for Critical Care Admixtures and Chemotherapy Admixtures on a 27" x 27" wall chart. 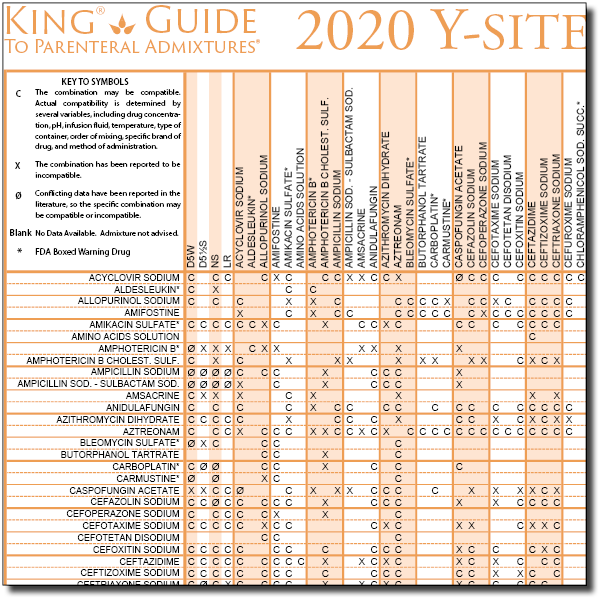 Wall charts provide a convenient centralized offline way to quickly confirm the advisability of mixing intravenous drugs and a simple way to determine if more in-depth information is needed from the full text monographs provided in the complete King Guide to Parenteral Admixtures. At nurses stations, the wall charts provide IV compatibility information at the point of care. Having easy access to this information saves valuable time by reducing the need to call the pharmacy and provides nurses valuable information to confirm and verify drug compatibility questions prior to patient administration. Drug Shortages? Need an alternative Diluent? The ongoing shortage of drugs, and especially small volume parenteral solutions, is causing changes in methods of drug administration. 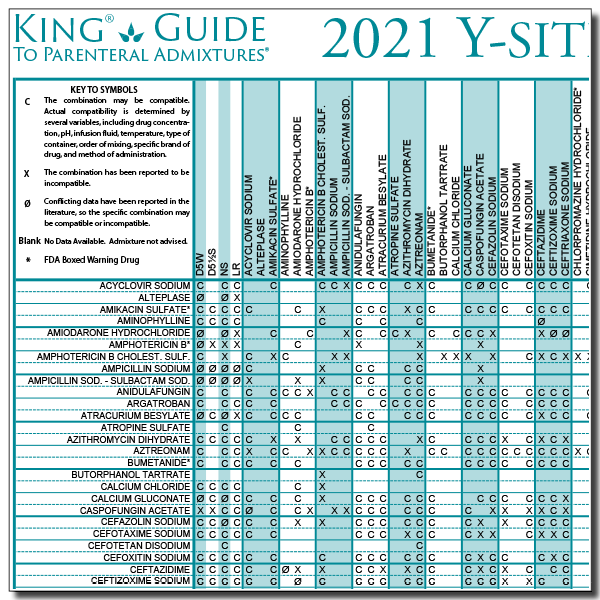 The King Guide® to Parenteral Admixtures® Wall Charts can provide a quick alternative diluent to saline. Designed to report y-site compatibility of intravenous drugs commonly administered to patients in the hospital, in emergency, and in home care/hospice. 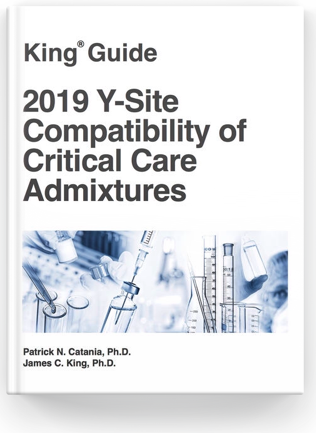 Designed to report y-site compatibility of intravenous drugs commonly administered to patients receiving chemotherapy and includes antibiotics and parenteral nutrition admixtures. Need Information On More IV Drugs? 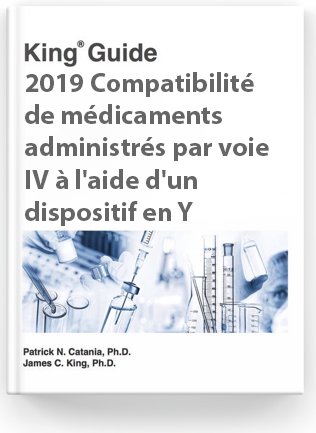 Full text monographs for most every injectable drug available are reported in the complete King Guide to Parenteral Admixtures. Copyright® 2019 - King Guide Publications, Inc. - All rights reserved.